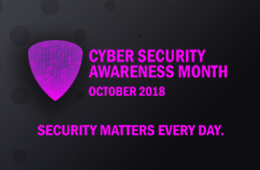 October is national Cyber Security Awareness Month and the Information Technology Services (ITS) division is spreading the word to the University of Toronto (U of T) community. Students, staff and faculty are all invited to join in a number of activities that will help keep you, your data and the university secure. Social media – including a creative contest! Our digital world is expanding at rapid speed and with this advancement comes increased concern of viruses, malware, phishing attempts and more. That’s why cyber security awareness must be built into our daily mindset and practices – not just right now, but year-round. If you suspect a phishing attempt/malicious email contact us at: report.phishing@utoronto.ca. *Submit your questions for the Oct. 10 panel discussion to: its.eda@utoronto.ca.